A Day Late and A Dollar Short: October in the Garden! A cast of creepy characters will be cropping up around the Atlanta Botanical Garden in October, welcoming guests to crisp, cool autumn strolls. Scarecrows in the Garden features more than 100 whimsical creations by area schools, artists, designers, families, and businesses perched throughout the Southern Seasons Garden and Children’s Garden October 4 – 30. The sometimes wild and wacky scarecrows compete for prizes in one of two divisions -- professional and non-professional – and visitors will delight in discovering their own personal favorites. In addition, they’re invited to enjoy family fun games and crafts on Saturdays and Sundays from 10 a.m.- 4 p.m. 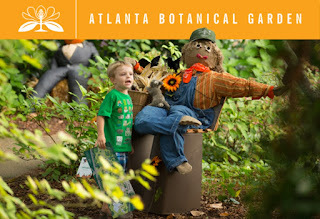 Finally, on Sunday, Oct. 23 Goblins in the Garden returns with its kids’ costume runway, storytelling, crafts, pony rides, and more from 10 a.m. - 4 p.m. For more information, visit atlantabg.org. *The mission of the Atlanta Botanical Garden is to develop and maintain plant collections for display, education, research, conservation, and enjoyment. The Garden is located at 1345 Piedmont Ave. NE in Midtown, between 14th Street and Monroe Drive. The Garden is open from 9 a.m.-7 p.m. Tuesdays and 9 a.m. – 5 p.m. Wednesday through Sunday. Admission is $21.95 adults, $15.95 children 3-12, free to children under 3 and Garden members. For more information visit atlantabg.org or phone 404-876-5859.